Inspired by a piece written earlier by Alex Stewart, which you can read here, I decided to do some sort of light-hearted review thing on this World Cup. I had initially intended to write article upon article during the proceedings full of wit, analysis and witty analysis, but I was too transfixed by my television screen to contemplate doing much else. As a fairly young, nearly-entering-my-twenties football fan who didn’t become particularly interested in the beautiful game until 2002 (largely thanks to the tournament held in South Korea & Japan 12 years ago… Jesus Christ, that makes me nostalgic) I haven’t had much personal experience of the World Cup. I enjoyed watching the spectacles in 2006 and ’10 without wholeheartedly loving them with thorough enthusiasm. 2002 remained my favourite tournament purely because it acted as my introduction to football and captivated me in such a way that I started becoming a devoted follower of such a beloved sport. This year’s championship in Brazil was the first major football tournament where I could define myself as a journalist/blogger as well as an avid watcher – and it certainly didn’t disappoint. About one month before the opening ceremony had begun, I was already doing my research. I had got myself involved in a good ol’ fashioned game of Fantasy League Football courtesy of the Sun and was thus contemplating which players to put in my starting XI. As well as this, I also (like almost everyone who watches football) predicted who was going to make the final – and without trying to seem smug, I had guessed correctly, but more on that later. When June 12th came around, I was anticipating excitement and entertainment. The first team to beguile me (and consistently did so until they were knocked out in the quarter finals) was Colombia. Written off by a couple of cynics due to the loss of Falcao, I was crossing my fingers that they would prove the doubters wrong, which they naturally did with ease. Not only were they a team full of pace and exuberance, the individual performances of key players were breath-taking and added so much more to the fabric of the side. I was particularly impressed by: Mario Yepes for his abundance of composure despite being 103 years old, Juan Cuadrado for his ability to beat opponents and desire to bomb forward and finally James Rodriguez… or is it just James?… or just Rodriguez? The 23-year-old was not only top scorer but my favourite player of the tournament. Unbelievable passing and having a good eye for goal made him incredibly compelling to watch. Following England’s abysmal showing (you can read my review on England here) I decided to support Colombia in the knockout stages, with only the brilliance of Brazil (NOTE: it wasn’t such an oxymoron at the time) halting their progress to the semi-finals. Unfortunately I had other commitments whilst Spain and Netherlands were playing, but I was expecting a mediocre draw or maybe a slim win for the 2010 World Champions (who are still ranked numeral uno might I add). Although Van Gaal’s side had impressed throughout qualification, I was fairly certain that they would be overcome by the strength of Chile and also their European counterparts. Imagine my surprise when I looked up the results later that evening. It turns out the Oranje young guns had only gone and thrown a massive middle finger in the face of tiki taka and tournament experience. Van Persie’s flying Dutchman goal just looked incredible when I watched the highlights and the devious Robben was also impressive. It’s also worth pointing out how exceptional the Dutch have been in defence. They conceded three goals in the entire tournament, two of which were near impossible to prevent (a Xabi Alonso penalty and a Tim Cahill wonder volley). You will probably find some of the defensive quintet – Janmaat, De Vrij, Vlaar, Martins Indi and Danny Blind – in various different World Cup XIs or dream team’s. Their most impressive showing was probably against Argentina in the semi-final, despite succumbing to penalties and eventually elimination. Group stage performances from France and particularly Germany (who were the most entertaining side to watch and, SPOILER ALERT, were the eventual winners) both performed in a very aesthetic manner whilst everyone’s dark horses Belgium were overly underwhelming. The shock team of the group stages was undeniably Costa Rica. The traditionally optimistic English fans probably hadn’t bothered to research them and as far as everyone was concerned, it was a contest between three footballing giants and one relatively small puppy. The 34th ranked outsiders turned Uruguay into a walking, playing joke, with the South Americans clearly lacking any bite in attack… (they just clearly didn’t have the teeth… although they did take a chunk out of England… shall I continue?). A 1-0 win over Italy was thoroughly deserved as they cruised through to the knockout rounds in facile fashion. Keylor Navas has to be given a large slice of credit for his nation’s accomplishments. During the entire tournament, he conceded as many goals as Manuel Neuer did in a chaotic ten minutes against Ghana. The Costa Ricans performed admirably as a unit whilst also having attacking prowess with the likes of Premier League stars Joel Campbell and Bryan Luiz… Wanchope who? I spent a duration of the knockout stages on holiday in Menorca with my girlfriend for a week and annoyingly Spanish terrestrial television doesn’t screen World Cup matches… who would’ve thought it. I made sure that I was in a local pub/venue showing live matches for the Brazil, Colombia, Germany and Argentina games (teams who I particularly enjoyed watching) but didn’t bother checking out any of the other teams, choosing to follow the matches on Twitter. Apparently watching two matches a day isn’t deemed as socially acceptable when abroad with the missus. One of the biggest mistakes I made was walking out of the Holland and Mexico match with five minutes to go, frustrated with how tedious the proceedings had become and that I was about to lose a tenner due to gambling on the Dutch. Before the tournament had begun, I had predicted Brazil to cruise through to the semi finals before being finally knocked out by Germany, but they hadn’t really fulfilled my expectations of playing the beautiful Samba football that I had seen in previous months. Neymar and Thiago Silva were predictably key players but the rest of the team seemed fairly average. Annoyingly, they decided to put on an impromptu display of excellence to eliminate my new favourite team and advance (arguably undeservedly) to the last four, during which they would face their biggest annihilation in World Cup history. Brazil vs Germany was a funny game to say the least. I was originally anticipating a 2-1 Germany win, but with the loss of Silva and Neymar, Brazil could either pull together or crumble to pieces. It was the latter they chose. Returning to the UK in time to watch this game, I was literally laughing at how bad Brazil were. David Luiz seemed to believe he was there to replace Neymar despite having central defensive duties, and thus wandered aimlessly into the attacking half, leaving a gaping hole for ze Germans to ambush. The four goals that Scolari’s team conceded in the brutal seven minutes looked like the sort of goals I conceded many years ago on the primary school playground. The defence just seemed to follow the ball everywhere, not noticing that there were any other professional footballers on the pitch at the same time as the bloke in possession… it was hilarious and will most likely haunt every yellow-shirted fan in Belo Horizonte for the next few decades or so. There were some games I slept through in the World Cup, largely due to the fact that I had a fairly exhausting day or they were just plain boring. Examples include Iran vs Nigeria, Japan vs Greece, Ivory Coast vs Japan and Nigeria vs Bosnia (all from groups C and F strangely). I also managed to doze off during Holland’s semi final against Argentina, which unfortunately was the result of two defensively impeccable sides cancelling each other continuously. Not only has this tournament been memorable for its magnitude of goals, it has also given us teams who have been admirable defensively, with players who have slipped under the radar proving their worth on the grandest stage of them all. Ron Vlaar, a centre-back who plays for Aston Villa, showed us how well he could perform as part of a terrifyingly young and gifted defensive force, despite plying his trade in the arse end of Birmingham. The final itself was a terrific presentation of tackling, stamina and passing – elements that are vital parts of every footballers arsenal. Regardless of the fact there was a certain lack of goals, it did have a true World Cup final essence – two equal sides desperately trying not to concede. It was disappointing not to see Messi step up and single-handedly destroy the hopes of the opposition, but alas he played fairly averagely, although he did have a half-decent tournament (not worthy of a Golden Ball, mind you). As I was anticipating the inevitability of extra time, I wondered how much better this game would be as an attacking showcase if Di Maria and Gotze would come off from the bench… Gotze did and the rest is history. The favourites won the trophy after scoring a late goal in extra time following a 0-0 stalemate in the original 90 minutes – sounds very much like the final four years ago. I would type some sort of cliché about history repeating itself, but that would be far too easy. The defence was fairly easy to choose. Mats Hummels and Philip Lahm were outstanding for their country whilst Ron Vlaar was an unexpected bright spark in the heart of Van Gaal’s defence. The surprise inclusions in the back line come in the shape of Marcos Rojo and Keylor Navas. Rojo is a very aggressive player who normally picks up the odd booking or two, but can be very productive when going forward, which I think he showed in the final. Keyler Navas was probably expected to concede a truck load of goals, but this conjecture didn’t quite materialise as his Costa Rica side fought their way to the quarters, despite being very much unfancied. Toni Kroos and Javier Mascherano have been highly rated for their sheer defensive effort and ability to spot a good pass, both players facing off in the final whilst being regarded as their respective country’s top performers. James Rodriguez has been the best player at this tournament and also picked up the golden boot on the way, a remarkable achievement for such a young midfielder. Arjen Robben and Juan Cuadrado (apologies for the misspelling on the graphic, it wasn’t me, I swear) have scared defenders with their speed and have been a constant source of assists. Cuadrado in particular has statistically created the most goals at this World Cup. Lastly, Thomas Muller (or Mueller if you want to be technical about it) has been a lively poacher during Germany’s cup triumph and his goals propelled them to dizzying heights in the tournament. Without trying to sound as patronising as possible towards you, the reader, football was a lot different 84 years ago. Fitness and safety conditions were not seen as paramount concerns and the structure of your average team differed substantially to the tactically precise vision of the modern beautiful game. In the 1930 World Cup, an average of 3.88 goals were scored per match and this was mainly due to the emphasis on attack. Teams often lined up in a 2-3-5 or 2-3-2-3 formation, with five forwards and five defensively minded players taking their place outfield. It wasn’t until after the 1960’s that teams started to care more about not conceding as line ups contained a bank of four playing in defence. In the 1962 World Cup in Chile, there was only an average of 2.76 goals per game, contrasting heavily with the 5.38 average recorded in 1954. In the modern era, defensive abilities are considered more of an art form and coaches believe that a solid back line is the foundation to building a successful starting line-up. The pessimistic approach of 21st century manager’s seems to be that if you concede first, you’re inevitably going to be chasing the game, whilst in the early 1900’s the underlying ethos of ‘scoring more than your opponent’ seemed to be the correct course of action in order to be victorious. Liverpool tried to quasi-implement this style of play during the 2013/2014 Premier League campaign and were almost successful in winning a domestic title, but focusing mainly on your strikers and hoping your defensive frailties aren’t exposed is destined to fail in an age where scouts, managers and pundits can recognise the strengths and weaknesses of every single team after observing just a few of their matches. In the 1930 World Cup final, Uruguay and Argentina were the teams to watch having comprehensively disposed of Yugoslavia and USA in the semis with both countries recording 6-1 victories. Guillermo Stabile was the key player for La Albiceleste, netting a brace in that particular match and also going onto score a goal in the final. For the Uruguayans, Pedro Cea caused the most problems, scoring four goals in the semi and final collectively. Both of these individuals played on the attacking front line for their respective nations, and it was this front line alone that was responsible for scoring. Presumably, the defensive players in each line-up were instructed to stick to their defensive duties: no running up for the corners or anything silly like that. The final finished 4-2 to the hosting nation and remains the joint-second highest scoring World Cup final to date, with only Brazil’s 5-2 triumph over Sweden in 1958 recording more goals. What a final that must have been to watch for the neutral. The amount o f attacking minded players that Uruguay have in their squad means that fielding this XI will be fairly simple for Oscar Tabarez. Suarez, Cavani and Forlan will be the main goal scorers while Abel Hernandez and Christian Stuani will have access to the wings in order to set up chances for the trio. Diego Lugano will be in his element as part of the back five since he could move about the pitch in an indolent manner whilst Egidio Arevelo can slot in at the back easily as a natural defensive midfielder and play long balls into the strikers. The full backs should be comfortable enough playing in a more defensive role as well, but the goalkeeper would need to be on top form to prevent conceding to Messi & co. With a lack of midfield players required, Gaston Ramirez and Walter Gargano would probably not make the starting line up but the stability of the defence along with Hernandez and Stuani dropping back means that they should be able to cope. The Argentina XI seems more organised and manager Alejandro Sabella will probably appreciate the balance between solid defence and electrifying attack. 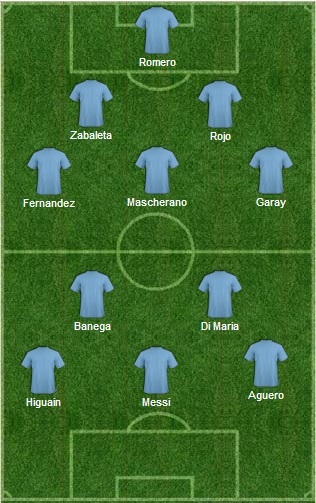 The deadly quartet of Di Maria, Higuain, Messi and Aguero would have attacking freedom whilst Lavezzi is more than capable of making an appearance from the bench to replace Banega if they require more goal-scoring prowess (which would be unlikely). In the defence, Mascherano can slot into a centre-half role that he has played before at Barcelona whilst Garay and Fernandez are strong in the air and can prevent any long passes finding their way to the Uruguay attack. Zabaleta might be frustrated with the lack of opportunities to go forward in an inflexible formation but will still play a vital part in defence. There is no space for Martin Demichelis or Fernando Gago unfortunately. Of course, there are some inevitable consequences of fielding this formation in a 2014 football match. The fact that a rigid defence playing deep inside their own half will be any quick-paced striker’s dream would see them being bombarded with attack after attack for a full 90 minutes. The offside trap would be difficult to play with deep lying defenders and thus both teams will be inviting pressure on themselves. Finally, especially in the case of the 2-3-5 formation, the gaping space between defence and attack would be exploited and the opposing side would retain a majority of a position in the midfield. Whilst footballers weren’t strictly considered to be ‘athletes’ in the 1930’s, they certainly are now. Pace and agility are the new meat and drink for the average player, especially in the Premier League (where you will find many top class World Cup players week in, week out). However, with the addition of the attacking full back now common in modern football in order to try and gain a advantage via the wings, some may argue that the basic structure of the 2-3-2-3 formation used by Argentina is still alive today in different variations. In 2010, Jonathan Wilson examined the introduction of 2-3-2-3 in teams such as Barcelona and Mexico, but instead of relying on full backs for their defensive duties, they now operate in almost contradictory fashion. Although the idea of either the right back or left back pushing up the pitch to lend support to the attack is not exactly a new phenomenon, using both full backs in offensive positions simultaneous is reminiscent of pre-1960 tactics. In this version however, the centre-backs lie deepest and the full backs would slot alongside a defensive midfielder in the preliminary stages of the game, but then would advance forward to link up with wingers while their team was attacking. Here is how Mexico lined up against England during a friendly in 2010. 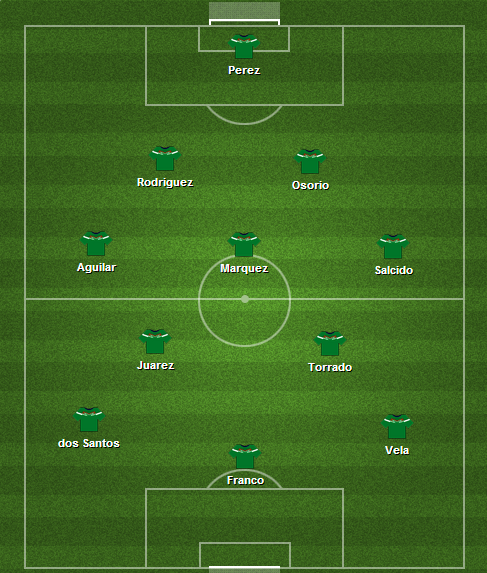 In this formation, Salcido and Aguilar are the full backs, but move forward when the team has possession. This means that Rafael Marquez has to move back in between the centre backs in order to form a solid defence. When England was attacking, Salcido and Aguilar moved back into their original defensive positions while Marquez provided cover in front of the back four. 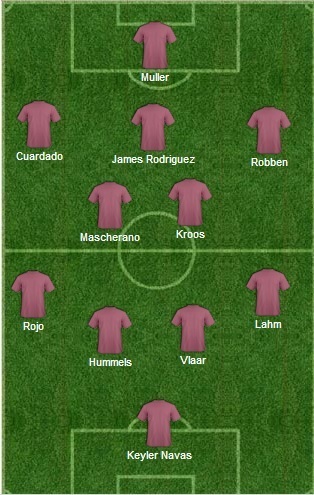 This provides a fairly stable 4-1-2-3 formation, which transforms into 3-4-3 when the Mexican full backs are advancing. These tactics are based on the positions of the original 2-3-2-3 but with added dynamics in order to cope with the pace of modern football. Did this work? No. England won the match 3-1. Although Mexico were impressive in attack, they were wasteful with their opportunities. Conceding goals from set pieces was their main undoing, which shows that in order for the 2-3-2-3 to work, you need aggressive defenders in the air. It remains to be seen if this original style of formation is to be used successfully again in the 21st century, but provided it is implemented by a side that contains attacking full-backs, pacey forwards and organised defenders, it can become as successful as it was during those early years of World Cup football.